both predating 1845 when Texas became a state—are typical Texas pioneer houses. "It was common report that Colonel Coles was very well off in property. This I know, he was a very good liver at home and appeared to have plenty around him for comfortable living." Coles’ family gravestones in Old Independence Cemetery. Now and Then: Early photograph shows Coles Cabin on original site, and before part of the house was destroyed by the 1900 hurricane. 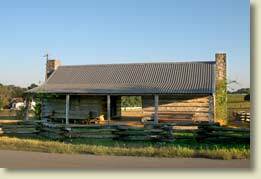 Built just a short distance northwest of this location, the Independence Historical Society moved the John P. Coles Cabin and the Independence Log House to Old Baylor Park (near the columns), to ensure their preservation and to make them accessible to the public. Coles Cabin In 1822, John and Mary Eleanor Coles migrated from Georgia to Texas with their two children and three slaves. Coles was given extensive holdings when the Mexican government issued land grants, making him one of the “Old Three Hundred” to settle in Texas. Around 1825, the family came to what is now the Independence area and established Coles Settlement. The Coles’ house was the center of land and political activity because John Prince Coles (1793-1847) served as a personal agent of “the Father of Texas,” Stephen F. Austin, and was appointed first Alcalde in the upper portion of Austin’s colony when Texas was a Mexican territory. In 1836, he was appointed the first Chief Justice of Washington County by Sam Houston, first President of the Republic of Texas. It was in this house that John and Mary Coles raised their large family and managed their farm operations. Coles also took an active interest in establishing educational institutions in the area. 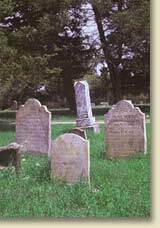 The Coleses and seven of their twelve children are buried in the Old Independence Cemetery. The Log House is a typical dog-trot house with rooms on each side of an open gallery, or breezeway. It was a house type frequently built in pioneer Texas. The gallery provided occupants with space where they could eat, sleep, play, and do household chores in the fresh air while protected from the sun or rain. The first person to live in the house is believed to be noted frontier Presbyterian missionary Hugh Wilson (no relation to William) who rented it. In 1842, Jesse McCrocklin—blacksmith, veteran of the Battle of San Jacinto, and “an adventurous man”—bought the house but lost it gambling. The Independence Historical Society offers free tours of both houses and Mound Hill Schoolhouse, also in Old Baylor Park, on selected March and April weekends. For group reservations and fees, call Lanella Gray at 979-830-5576. The Independence Historical Society is a non-profit membership organization founded in 1966 to encourage the preservation of records, artifacts, buildings, sites, and structures of historic interest. The Society, now numbering 225 members educates the public about the significance and value of the Independence comunity through its monthly meetings, special events, marker program, and stewardship of three historic buildings adjacent to Old Baylor Park. Find where this site is located on our Independence Map. Return to TOURING INDEPENDENCE to see other historic sites. Documentary photo: The Texas Collection, Baylor University. Masthead photo:Jeff Heger Photography. Other photos: Ellen Beasley. Research and content by Ellen Beasley.